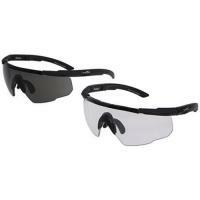 The 2 Saber Advanced Grey/Clear Lens Matte Black Sunglasses from Wiley X offer ultimate eyesight protection. The sleek, matte black frames are intended for medium to XXL-sized heads. The smoke grey lenses allow 15% light transmission for maximum glare reduction without color distortion. The clear lenses permit 90% light transmission and are perfect for overcast to very low light conditions. Both pairs of lenses guarantee 100% UVA/UVB ray protection. As with all of Wiley X's lenses, these are crafted from Selenite™ polycarbonate for shatterproof protection and then coated with a T-Shell™ treatment for impressive scratch resistance. A Take Flight nose piece adjusts to fit the bridge of any nose comfortably, while the foam brow bar shields eyes from sweat, debris and additional sunlight. The Saber sunglasses include a microfiber storage bag and tactical strap. Prescription lenses are compatible with these frames, but are sold separately through Wiley X's carrier (PTX).